Pushing a pickup truck out from the mud | Jon Katz, P.C. In a vacuum, courtrooms and jails — particularly jails — can be very cold, gray and depressing places. Consequently, one of the best things a trial lawyer can do to counterbalance such grayness is to get out and about, and to go on the road repeatedly. To those who haven’t opened their own law firm yet, I recommend finding the time now for extended excursions, and to enjoy the local scenery when traveling to interesting places for court (e.g., for me, I particularly enjoy spending some extra time in the mountains, on the shore, in the river areas, and in Baltimore). 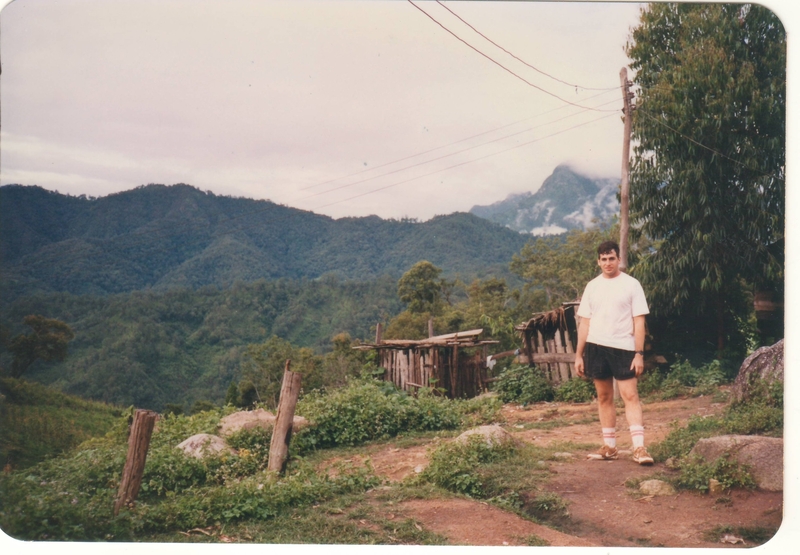 My longest excursion after law school was several weeks in Southeast Asia before starting full-time work after taking the bar exam, with the best time being a three-day trek in Thailand’s Golden Triangle. During the trek, some of my co-travelers partook of the free flowing opium and marijuana, casting to the wind any concern about the prison sentences and conditions in Thai jails. I suppose I could have been swept up, too, in an arrest, seeing that the owner of the first hut where we stayed smoked along with some of my fellow travelers while I was just a few feet away. I had not yet been introduced to the realities of dragnet drug arrests. For those willing, I highly recommend spending some time away from fancy hotels. In Bangkok, I learned about the hotel that I selected when I bumped into a woman working there, on the same bus taking me to the Banglamphu area where many trekkers stay in that city. She apologized that only double rooms were left — at $4.80 nightly versus the $3.20 nightly single rate — and promised to add another traveler to my room for me to pay less; I opted for the privacy. Each morning, I awoke and walked among the nearby neighbors living in buildings with corrugated metal roofs, something that would not have been possible had I stayed at the equivalent of a Hampton Inn or fancier. The hotel was in my kind of place, seeing that the hotel owner’s daughter told me that her friends and acquaintances would not be caught dead in this neighborhood that was hardly respectable enough for them. I learned that a guest at a nearby hotel got bitten by bedbugs, but my hotel — more like a guest house with cabin-type material and design — was pristinely new, only furnished with army mattress beds, an oscillating fan, a table for the fan, and a towel-type blanket to soak up the inevitable sweat; in the morning, I had to ask for a bowl of boiling water for shaving, because the running water was room temperature. The hotel was convenient to the main Buddhist temple, and to a klong boatbus stop to go north to the residential neighborhoods and south to the morning market, for a ride long enough for me to teach myself to count to ten in Thai (neung, sawng, sam, see, ha, hok, jet, paet, kao, sip). On my third night, I boarded an overnight bus to Cheng Mai, the major northern city, to trek in the hill country. The travel agent for my bus to Cheng Mai, a friend of my hotel owner, arranged for a taxi to the bus station, dozens of rambutans and mangosteens for the ride because the sitdown meal break would not meet my vegetarian lifestyle, and a night in a guest house. My guesthouse room had an obnoxiously loud and unsanitary-seeming leak in the washroom. When the owner would not give me a new room or fix the leak, I went looking for another guest house; all innkeepers said they were fully booked, which sounded fishy. The owner finally relented, gave me another room, and said “No more rooms,” so maybe I had hit the height of tourist season. Some other guests at the guesthouse recommended choosing a trek through my innkeeper (the same one who at first resisted giving me a non-leaky room; I should have known), and suggested a tour that has less tourist traffic even if less popular. My innkeeper promised that my selection had little traffic, but at least four other tour groups were at the first two of three overnight village stops. On the third and final full day, our tour guide was too exhausted from opium to take us further than an alternative village on the riverbank to which we traveled by bamboo rafts from the Karen village where we awoke that morning. At the final riverside village, I was entranced by the hut owner’s baby monkey; by contrast, the next morning we crossed the very fast river to join traditional mourning for a man accidentally shot dead when trying to stop his friend from committing suicide; his body was laid out on the floor of his family’s hut, with his face fully exposed and a monk next to him. The stories from this three-day trek are many more, including joining some pre-wedding revelers over moonshine and song, teaching children to count in English, and bathing in a muddy-brown yet clean river. I will finish with the story of our vehicle ride on day one of the trek, when I was met at my guesthouse by a pickup truck converted and covered in the back for six to eight to fit comfortably. The tour company decided to squeeze in ten, but I was saved by the bell by remarking to the initial four other passengers how I wondered how we were billed only $48 per tourist. Irate at being stuck with paying the higher rate of $52, a pair of travelers promptly left the tour. Overloaded as we remained, we got stuck at least three times in the mud during a constant downpour, and all of us got out to push the pickup out of the mud, to the point that I was all muddy from chest to foot, and my white canvas sneakers stayed clay pinkish-brown for many months. A few times, I looked out over the mountain to see a sheer drop too close for comfort for an overloaded pickup on muddy roads. What was I thinking? Looking back, of course, the trekking experience remains priceless.